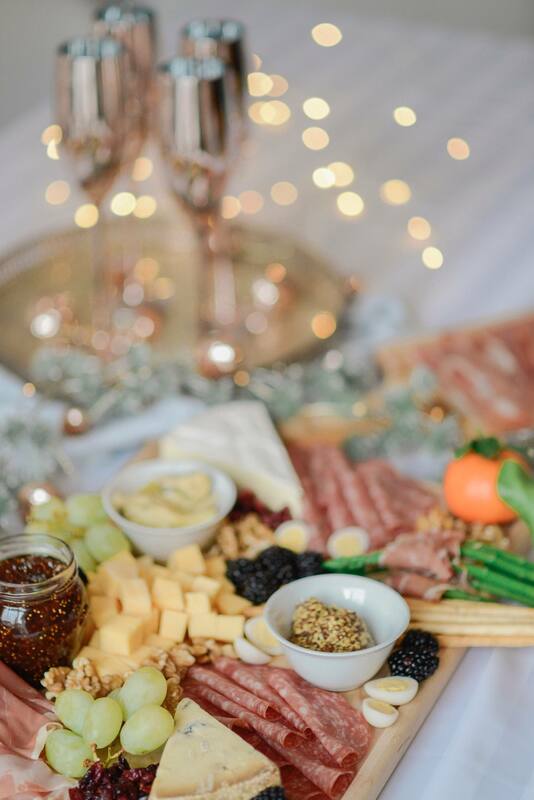 Well, after sharing delicious recipes featuring Mastro & San Daniele cured meats the last few weeks the highly anticipated charcuterie spread is finally here! I’m sure you could see it coming and if you’re anything like me, this will be your favourite recipe of them all! 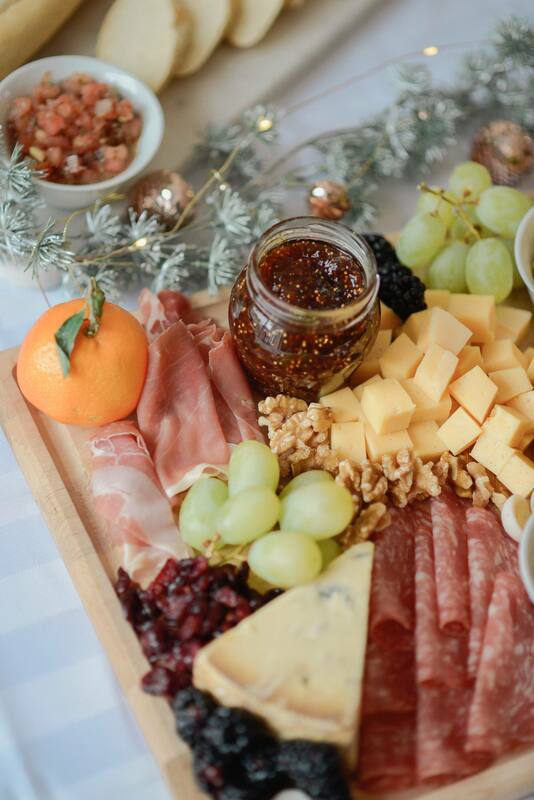 Nothing get’s my mouth watering like a good selection of the finest cured meats paired with delicious cheese and accompaniments. The best thing about charcuterie spreads are that they aren’t complicated. They’re so easy to put together and take the stress away from holiday entertaining yet they still look very elegant. 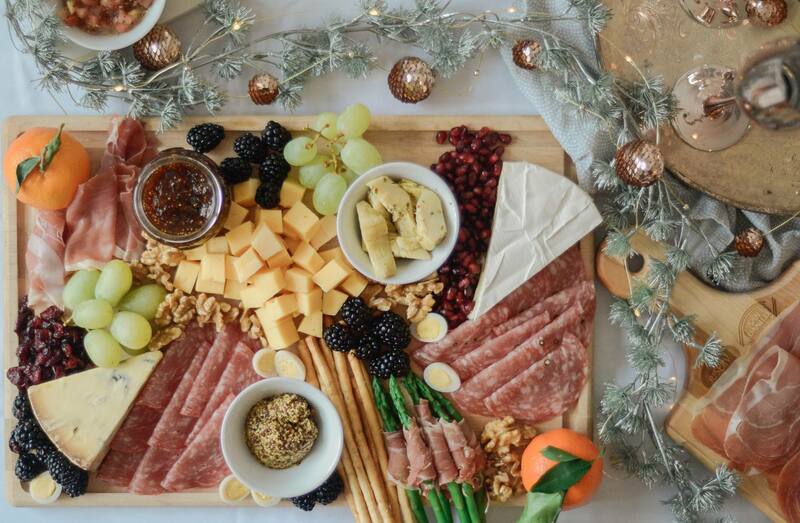 That’s the key to hosting holiday parties: finding uncomplicated dishes that wow your guests. Using at least three different cured meats is the best way to start your charcuterie spread. Once you know what kind of meats you’re adding it’s much easier to decide on cheese and the finishing touches. I always pick up the Mastro & San Daniele Charcuterie Trio as we love the selection of meats they include (Genoa Salami, Salami with Prosciutto and Prosciutto), it’s easy and I trust all of their products. It’s quick to grab at the grocery store and you don’t have to think about what pairs well with what, they’ve done it for you! Adding a variety of three different cheeses in mild, medium and bold flavours is the key to success here. Also adding a mix of both soft and hard cheese is important. We usually stick to Brie, Gouda and Blue cheese. They provide a good mix of flavour so theres something for everyone. Pickled quail eggs have to be my favourite garnish, they add a touch of elegance to the charcuterie spread. Perfect for the holidays. We also like to add a variety of olives, Walnuts for some crunch, Blackberries and dried cranberries to sweeten things up and add some grapes for colour. Adding a few small dishes with condiments to the spread is key. They are great to spread on the baguette before topping with cured meat and cheese. Try adding a variety of sweet and savoury condiments like olive tapenade, apricot preserve, grainy mustard, bruschetta and fig jam. Assembling a beautiful charcuterie board isn’t as daunting as it looks. Start by laying out your cheese – 1 cheese per 1/3 of your board. After the cheese is in place I like to fold the cured meats and add them side by side along the cheese (I try to pair the cured meat that best matches that cheese together). Wherever you see a large gap just add in the small condiment dishes and then you can start placing your garnishes and crackers in the open spaces. When I start filling in the spaces I like to add pops of colour to the bland looking sections of the board and put the cracker in last. Voila, you are now ready to entertain your guests! 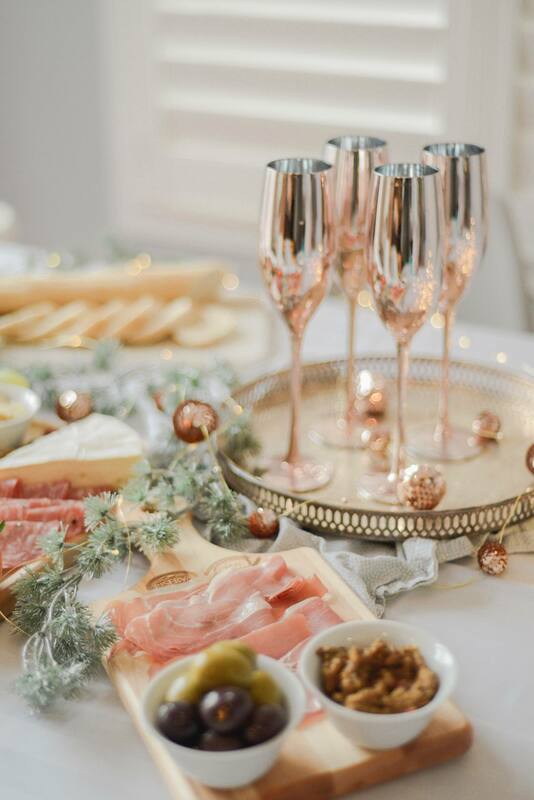 Mastro & San Daniele and I had so much fun creating these holiday entertaining recipes and ideas for you and we’re giving you a chance to win a GRAND Prize Mastro prize pack! Entering is easy! Head over to Facebook and give both Mastro and Renee M. LeBlanc a like. Come back here and comment who you’d make a charcuterie spread for if you won! This post was sponsored by Mastro & San Daniele however all thoughts and opinions are completely my own. I’d make a Mastro charcuterie spread for my guests at my New Year’s party. 🙂 thanks! I will have a nice get togather. Do I have to share if I win? Can’t I just eat is all myself? If I HAVE to share, I would invite a few friends over to enjoy with me! I would love to make a great charcuterie spread for my siblings when we get together next. I’d make a Mastro charcuterie spread for my family and a few close friends. I would make a Mastro charcuterie spread for my husband and children and we would enjoy it on Christmas Eve. I would make the Mastro Charcuterie for my husband Jessy. I would make a charcuterie spread for my 2 teenage children my husband and a few friends for New Years Eve. It is going to be a quiet but enjoyable night 🙂 Thank you for the chance to enter. I would spread it ALL out for my 95 year old mom and her friends…Yes she has friends, ages 87-97! They would thoroughly enjoy every bite! I would make a spread for my mom. She would love it! i would make for my husband and kids! I would make one for my sister’s family. I’d make one for my husband. I’m having a party for New Year’s eve, so that would be perfect! I would make this for my husband – he loves meat and cheese! I would make this for my husband and kids. They all love meat and cheese to snack on! I would make one for my husband. I don’t know if I could make that spread your talking about….I would try, but not share unless it was delicious. Maybe I should make it for myself and then opt to share it with friends if I like it. It will be just the two of us for Christmas Eve, and I love to put out a nice spread! I would have this at my next family get together. Yum. I host family and friends over the holidays. I would make it for a night that I was planning on Entertaining, for everyone to enjoy. I would make a spread for my family and I to enjoy! I would make a spread for my parents! I would ake a charcuterie for my friends. I would make the Mastro charcuterie for family. I’d share with my twin brother. If I won, I would make a spread for my family, to enjoy at our get together in Jan. 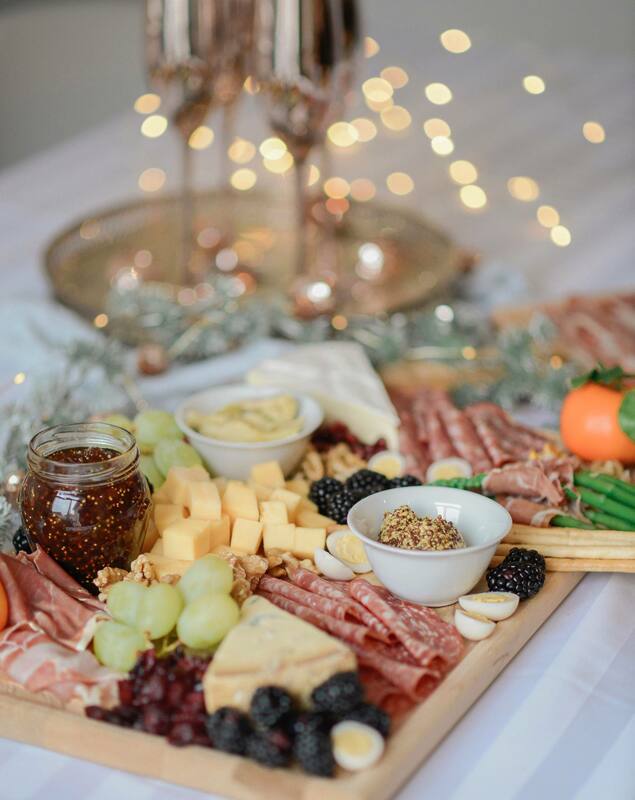 I would make a charcuterie spread for my family and friends to enjoy on New Year’s Eve! Congrats Mary! You won, please check your email! Id make a spread for my boyfriend , he would love this . I’d make it for my girlfriends! I would make a make a charcuterie spread for my son Ryan when he comes to visit! I’d make a charcuterie spread for my family on Christmas eve. I would make one for my parents and my sisters. I would share this with my family at home. They would really appreciate it.